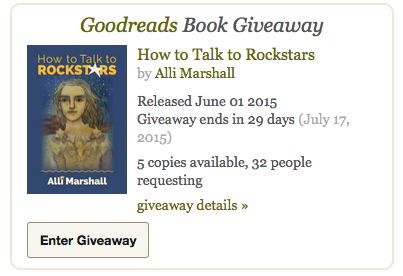 I’m giving away five copies of How to talk to Rockstars through Goodreads starting tomorrow. The contest is open through Friday, July 17. As of 12:01 a.m. tomorrow you can enter here. Let’s be friends at Goodreads. I’m answering authory questions, sharing my own reviews and hoping you’ll leave a rating or review of my book.